In the great age of the side hustle, everyone is trying to monetize their downtime. 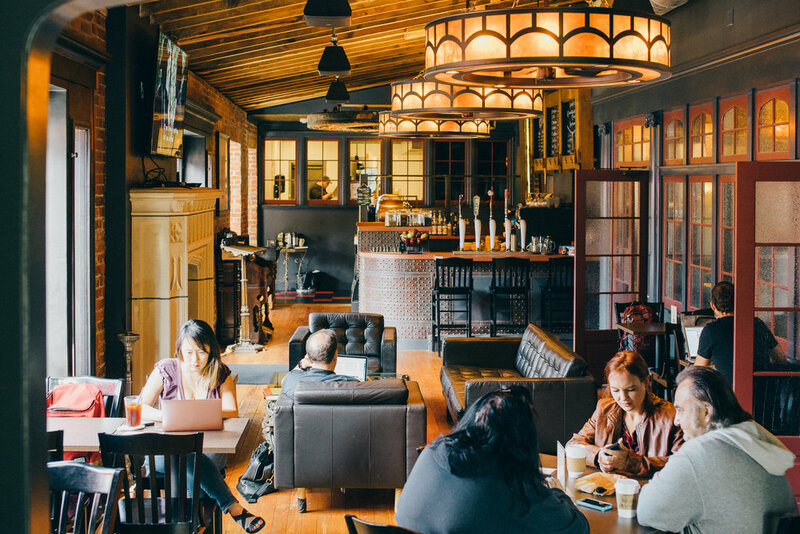 You basically can’t find a cafe that doesn’t have a young person with a laptop, whether they are in between meetings, writing that novel, or writing for PWF Events. But which cafe best suits your needs? In Pittsburgh, we have a variety of choices located throughout our city’s neighborhoods. Below are a few of my favorites. With over 160 choices, Dobra boasts the best selection of loose leaf tea in Pittsburgh. Dobra’s main selling point, however, is its bohemian-style atmosphere. Sectioned-off spaces with floor seating aim to create an environment that is both communal and meditative. With this in mind, going to Dobra feels like more of an investment than some other cafes. You’ll want to enjoy your tea, small plates, and cozy decor for at least an hour and a half. My favorite thing about Dobra is that you seat yourself and then alert the staff via a small bell when you have decided what you want to order. This process captures the exact level of customer service I want: a friendly exchange with no forced banter. Between the incredible decor and Dobra’s careful attention to detail in decor and presentation, this spot is perfect for tea nerds who want to relax, talk, or work. The Abbey is a great because it has a little bit of everything. Want to meet in the coffeehouse? You’ve got it. Want a bigger meal? Move over to the restaurant. Want to talk outside? There’s outdoor seating. If you’re doing an interview, having a business meeting, or just hanging out with a laptop, you have a lot of options. Pricier than the other places on this list, the Abbey isn’t a place I would go to hang out every day. While they have space for working with a laptop and a decent supply of outlets, the cafe can get a little crowded, making resources sparse. But for meetings or projects that require a bit more time than a typical day out, it tops the list in terms of food and drink selection. If you are working in a group that may want to stick around for dinner or cocktails, the Abbey is your ideal destination. For anyone looking for a conveniently located alternative to Starbucks, Rock ‘n’ Joe is a great spot. Right in the heart of downtown, Rock ‘n’ Joe has a decent drink selection and doesn’t get bogged down in the morning rush. For those to want to hang out and work, this cafe has plenty of space and outlets on their second floor. While their food options aren’t great, they have a decent turkey sandwich with bacon and hummus, and their bar includes small selections of chocolates and alcohol. Ineffable Ca Phe has everything you’d like in an American cafe with the added bonus of bubble tea, Vietnamese coffee, and pho. While the biggest distinction of Ineffable Ca Phe is its Vietnamese food offerings (and a decent selection of them, at that), this spot holds its own in terms of space, selection, and atmosphere. After many visits, I still feel as though there’s plenty of the menu I’ve yet to explore. The location itself is great (adjacent to Lawrenceville) and the cafe is located in a space that used to be a motorcycle shop. There is ample seating – a section of the cafe feels a bit like a diner, but there is also a section with couches and books. If you’re looking for a decent cafe with a twist, Ineffable is a great place to spend an afternoon. Tupelo opened its Millvale location in 2016, and since then they’ve served as a little known, homey spot on Grant Ave. Directly connected to the Millvale Community Library, Tupelo boasts cozy decor and a great selection of loose leaf teas. The space here is small – there are only about three tables and a small group of stuffed furniture pieces. But Tupelo compensates with a colorful decor, a selection of books, and a room dedicated to their teas, equipped with a friendly staff member to help customers pick their favorites. I’ll admit it here at the top: Kickback is probably not the best place to camp out with your laptop. They do have free wifi and a friendly staff, but there is a dearth of outlets and you are surrounded by the sounds of pinball. That said – there is pinball. I’m not going to make a listicle about cafes and NOT put your pinball cafe in it. You can swap your cash for tokens, order a root beer float and pick from a range of oddly themed pinball games (I recommend Ghostbusters). Retro machines, milkshakes, and superhero decor is enough to earn a place on my list. I consider myself fortunate to live in a town with such a variety of tea options. They each have their own vibes, and Bantha is my personal favorite. Bantha Tea Bar in Garfield. Like the other tea spots on this list, Bantha has an exciting tea collection. The atmosphere is always relaxed, and the staff is friendly, but non-invasive. Bantha leaves something to be desired with their food selection, but they more than make up for it with their featured art, live music, and a Sunday brunch. I’ve yet to find Bantha to be too crowded, and the folks I do meet there are interesting and friendly. Like the other places on this list, they make up a great cross-section of Pittsburgh’s cafe hopping community. We recently dropped by the David L. Lawrence Convention Center for the 2018 Handmade Arcade to check out Pittsburgh’s local crafters and artisans. Each year the event showcases handmade clothing, candles, toys, woodworking, decor, and more. Below are some of our favorite highlights from the event. Check out all the vendors from the event here.